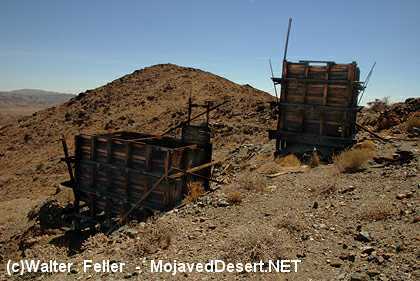 Clearly visible in the eastern Hexie Mountains about .75 mile from the Pinto Basin Road west of the cholla cactus garden is the Silver Bell Mine. Two ore bins, a dirt-covered shelter, and an abandoned mine road are all that remain. The mine operated between 1934 and 1962 producing minimal amounts of gold, silver, lead and copper. The ore bins held and fed rock to a stamp battery that crushed the ore into a sandy-watery pulp and pushed in on to an amalgamation table where presious metals were extracted. Though the mine operated some 40 years, ownership and details about the mine's riches are sketchy. Nevertheless, it was a versitile mine: gold in the 1930s, lead in the 1940s, and copper in the 1950s. Prospectors began staking claims in this desert region around 1865. Gold fever gave rise rise to mine names like Fore Aces, Big Bozo Claim, Lucky Turkey #2, and Hard Digging. Mining reached its peak in the area by 1917 and tapered off by the 1960s. Ore was hoisted from the Silver Bell Mine by the skip and dumped onto the grizzly, which sorted ore into the tipple. A 1958 assay report showed the Silver Bell Mine as having low gold and silver values but high copper values--worth about $90 a ton. Note - Mine shafts and adits are unstable and may be filled with harmful gases. Use great caution around old mine workings and leave them undisturbed. Collecting rocks and artifacts is prohibited. Geology - The workings follow a fault zone containing gold-bearing quartz veins within gneiss. Primarily - Creosote bush scrub habitat.